Located near the intersection of SE Belmont St and SE 7th Ave, Extra Space Storage serves Portland residents near Buckman, Ladd's Addition, Hosford-Abernethy, Kerns, Downtown Portland, and more. Locals will recognize our facility across from The Commons Brewery. Extra Space Storage is about 1.3 miles from University of Oregon in Portland, 1.5 miles from Portland State University, and 3.9 miles from Reed College, providing college students with convenient storage options over the summer or while studying abroad. 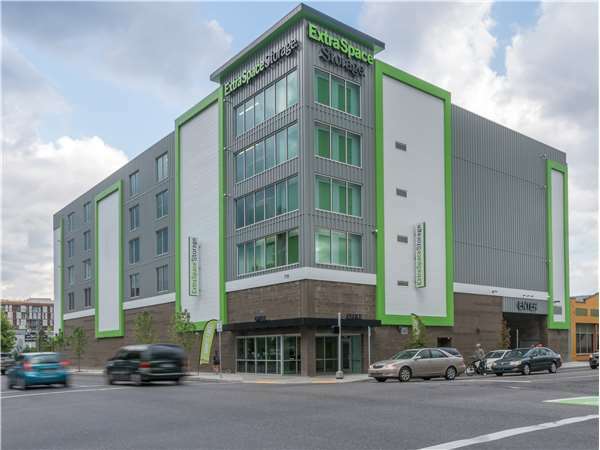 With a variety of storage units, climate-controlled storage, and exceptional security, Extra Space Storage on SE Belmont St is the self storage partner you can trust in Portland near Buckman! No matter what you plan to store at our SE Belmont St storage facility, we have the space you're looking for! We have unit sizes from 5x5 to 10x30 with indoor access, first-floor access, and elevator access. With top-notch security features like 24-hour video surveillance, security access to your floor only, and electronic gate access, you can store valuable items with confidence at Extra Space Storage. Concerned about storing temperature-sensitive items in Portland? Protect them year-round in a climate-controlled unit! This amenity maintains a storage environment between 55 and 80 degrees at all times to prevent damage caused by extreme heat and cold. Extra Space Storage has the high-quality self storage solution that will work for you! We go the extra mile to ensure our facility is always well-maintained, clean, and secure. We also have a friendly, professional team that's happy to help with whatever you need. Contact us today to reserve a storage unit in Portland! 7th and Belmont, on the east side of the Morrison Bridge. Drive south on SE 7th Ave. Turn left onto SE Washington St. Take an immediate right onto SE 7th Ave. Our facility will be on your left at SE Belmont St.
Drive north on SE 7th Ave. Our facility will be on your right after SE Yamhill St.
Drive west on SE Stark St. Turn left onto SE Sandy Blvd. Continue onto SE 7th Ave. Our facility will be on your left at SE Belmont St.
Drive east on SE Stark St. Turn right onto SE 7th Ave. Turn left onto SE Washington St. Take an immediate right onto SE 7th Ave. Our facility will be on your left at SE Belmont St.